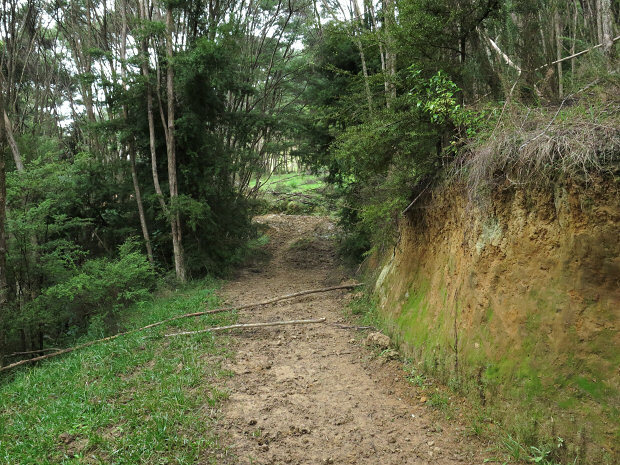 Diggers Valley: 30 April 2016. The week beginning the 30th of April 2016. We brought the calves in today for their pre-sale, post-weaning weighing. They're a lovely lot. The best way to compare their splendidness is to adjust their weights to a standard age. In the beef industry that's generally 200 days but I usually do a 180 day comparison as well, if most of the calves are closer to that age - if they're older, it's easier to adjust back by subtracting their average daily growth during the last period from their actual weight, but if they're younger, the calculation has to assume they'll grow at the rate they have done recently, which isn't always the case. The two smallest heifers made it to 220kg at 180 days, which is still a fairly respectable weight, when I think we used to wean heifer calves of that age at 180kg. They just look a bit puny now because their biggest sisters are over 270kg. The mothers of those two were 726, a cow whose first calf was poor too, probably because she has insufficient milk; she's on the cull list this year. The other was Fancy 126 but as this was her first calf (crazy 156), she gets to stay. After drafting the two little bulls and a couple of steers out of the mob, we sent the rest off out the back for the next few days. Poor 155, Imagen's daughter, who has spent her whole life with Zeb (Zella's son), was quite distressed at being parted from him; but it has to happen some time. 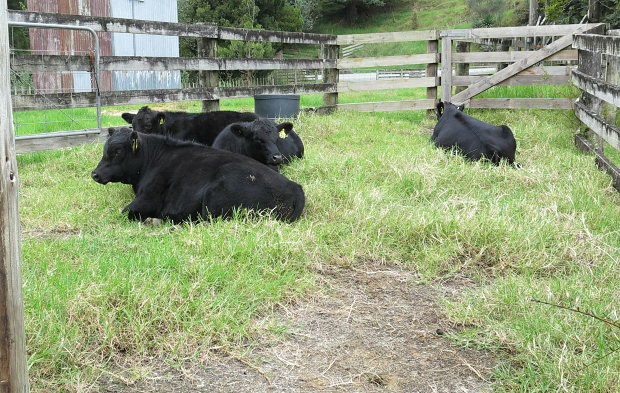 Back in the yards the four separated calves were quietly sitting, waiting. 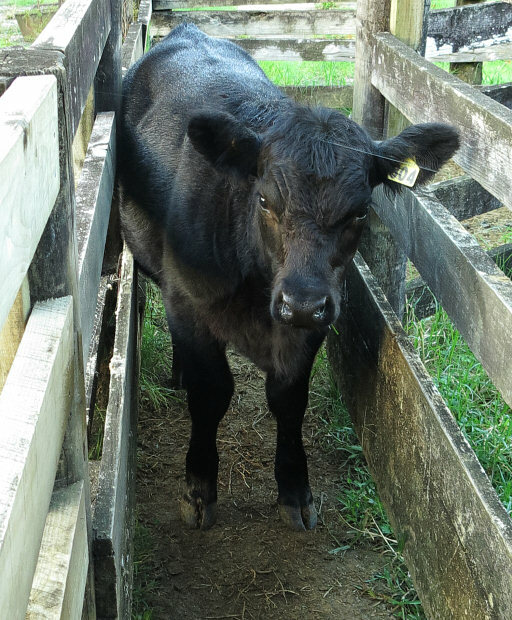 Usually I separate the bull calves a bit earlier than this but I'm fairly confident that they're never sufficiently sexually mature at this age to do any damage, so I left it for convenience's sake until now. The two steers have been drafted because a friend referred an acquaintance to me who wants a couple of quiet animals to grow on a small lifestyle block. 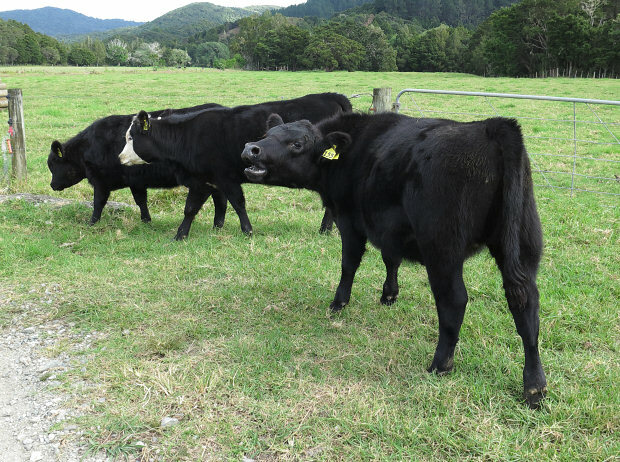 475's lovely son, 783, seemed to fit the bill, as does Zeb, so I've kept them back with the bulls for some molasses training until they go to their new home. I think this Puka has put on another growth spurt since I last photographed it. 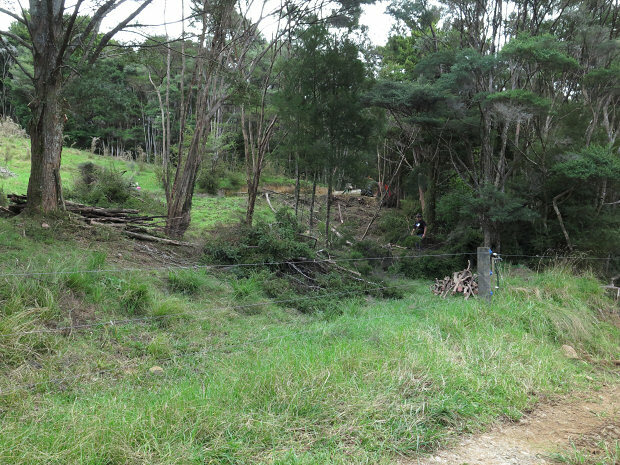 The latest Puriri reserve is now fenced, three wires, hot. 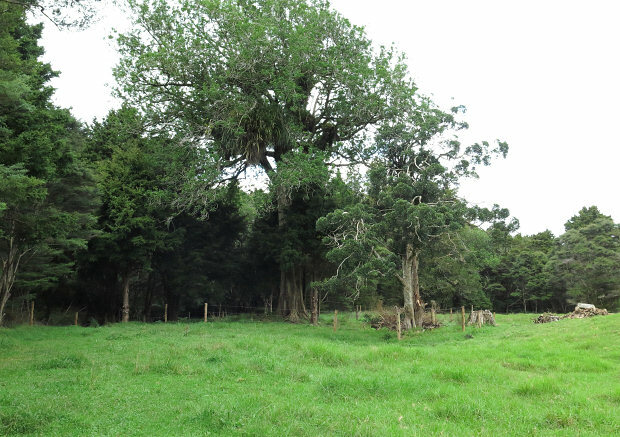 Later, when the cows next grazed the paddock, I wondered how we'd forgotten that we still need to fence the swamp which gave the paddock its name because it used always to be full of croaking frogs? Another task for later. 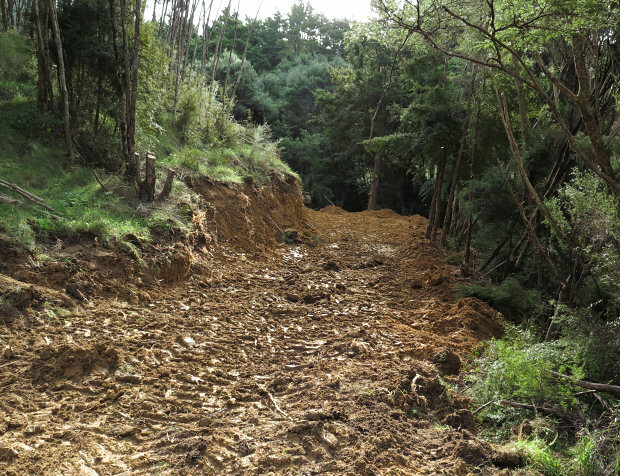 Now on to the next job: the upgrading of Route 356, to allow the watercourse which runs along the bottom of the PW, alongside the current track, to be fenced off from the cattle. They don't clamber down in to the wet area all the way along, but up near the Middle Back boundary, they often pug around in the wetland and there's a low area half-way along the track where they also access it. When we were rescuing 356 from the mud all those years ago, I clearly remember finding what was presumably one of the Mudfish, a slippery, narrow fish which appeared in the mud I was digging out around the steer. All species of Mudfish are endangered because of loss of habitat and anything we can do here to protect their environment is something we should do. I've long wanted us to fence this place. I went out to see the calves in the Middle Back, feeling as though I'd left the children without a babysitter - their first time on their own so far away from their mothers. They're all quite happy, with lots to eat. 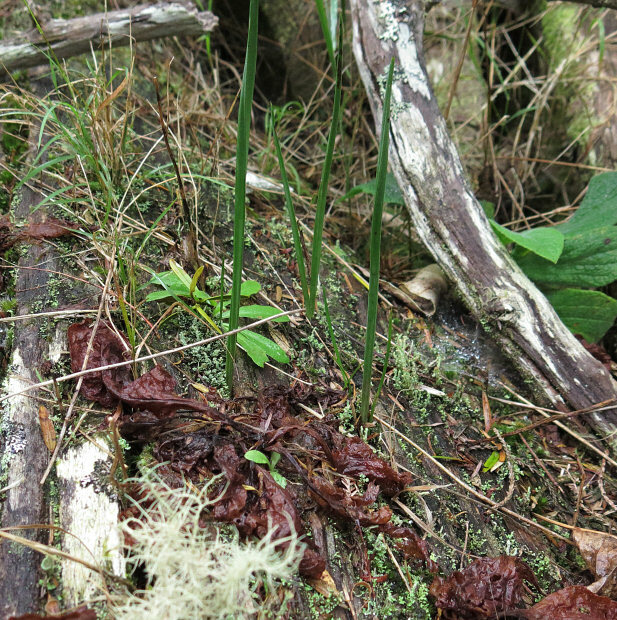 In the middle of the paddock, near one of the fallen-down dead Puriri trees, I looked to see whether the sun orchid plants were coming up again yet and they're much more advanced than they usually are. If only we could control the possum numbers out here, they might get a chance to flower! 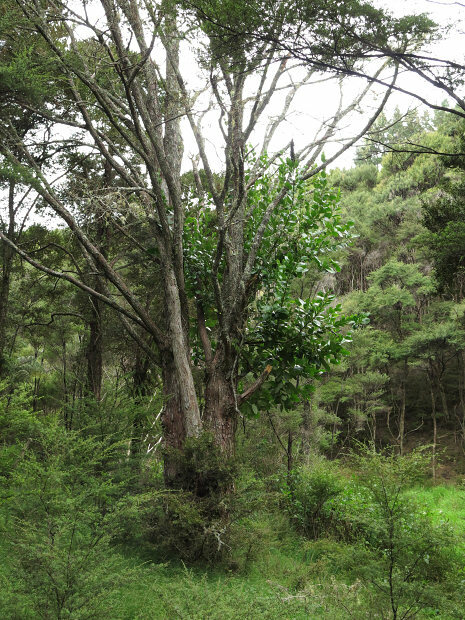 These, like most I find, are growing in a bit of old Puriri wood lying on the ground. I climbed back through the fence into the PW, from whence I'd come and took some photos of the track as I walked. This one looking back toward the Middle Back, with 356's stuck gully just over the rise. From the same point in the other direction, heading home. From the corner above, across the troublesome wet area where the culvert keeps getting blocked so the water runs across the track. 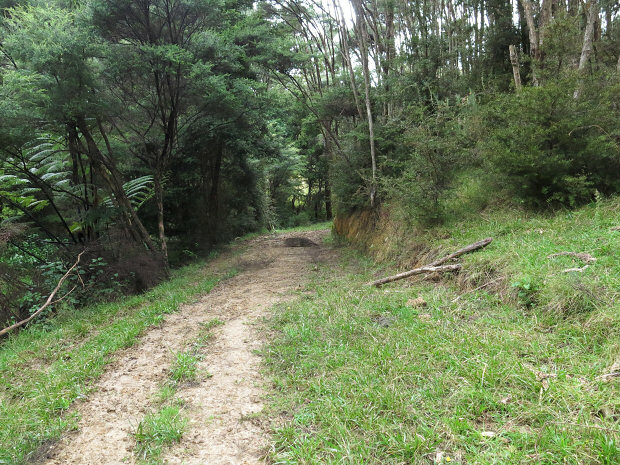 The green on the left is an area where the cows currently go off the track and into the wet. 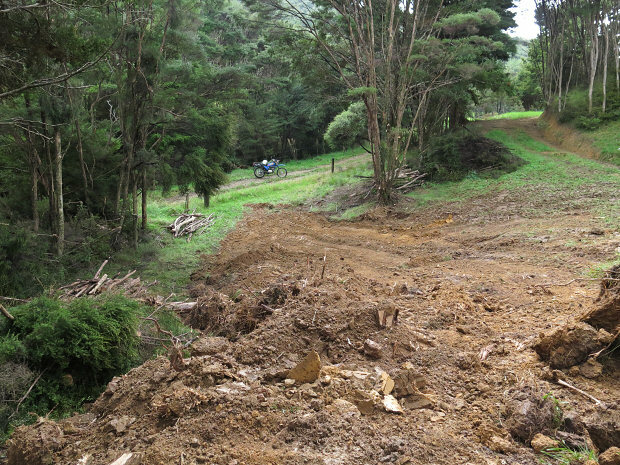 This part of the track made such a huge improvement to access along here when Stephan first dug it through and soon he'll widen it further. 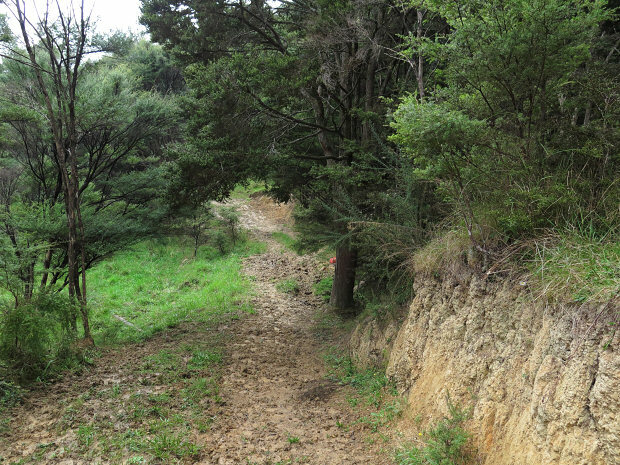 These steep-sided parts have been surprisingly stable; unusually for this farm, there's no water coming up out of the ground anywhere along this bit of the hill. The corner ahead always gets very boggy in the winter; the shape of the hillside causes a lot of water to run down there when it rains. Around the corner and out into the open again, with Stephan working on the tractor behind me. 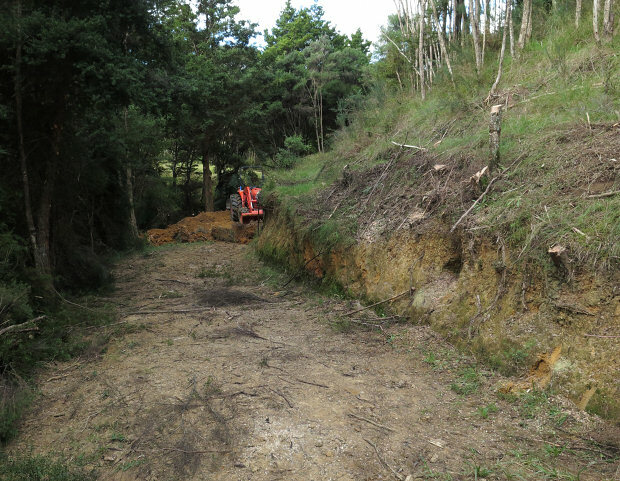 The work he's already done to begin forming a new access up onto the track is taking shape. The current gate into the paddock is along the track to the right, but it will make more sense to bring it straight up the slope from the main track where my bike is parked. 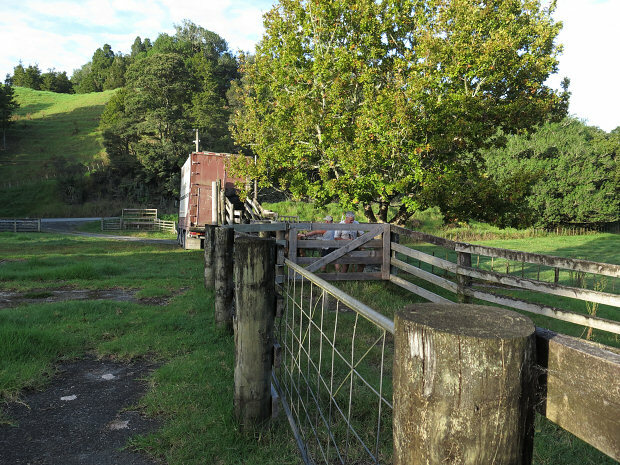 We'll decide what to do about the existing gateway later; it may remain as a gate into one part of the paddock, since the cattle are used to using it. I like these colours! Two chicks from a pair of birds I put together a couple of months ago when the hen started trying to lay in a nest box on the wall of the aviary, from which she kept being evicted by someone else. The two birds have been paired since sometime last year, but only recently showed signs of wanting to breed. 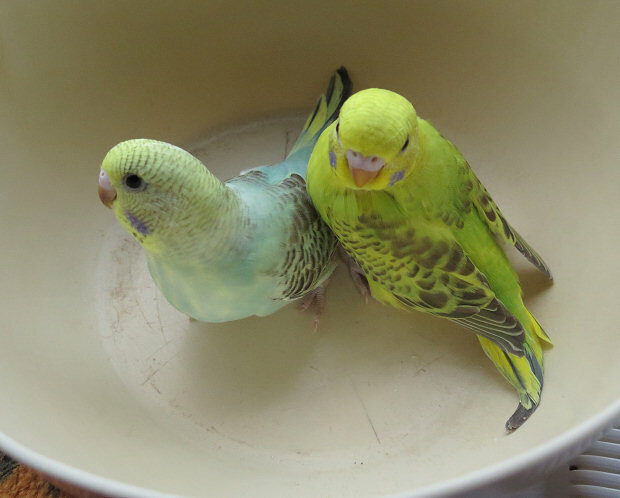 The yellow chick is jewel-like in its bright colouring. I've not seen anything quite like the other chick's shade of blue. We went in to town to get our flu vaccines this morning. The nurse who vaccinated us had a terrible cold, and said she was there on the basis that "someone had to work today" which seems outrageous, bearing in mind the exhortations of health professionals to the rest of the population to stay out of the way of other people if you're sick, so you don't pass it around! Fortunately we didn't catch hers. The hens were squawking about something today and when I went down to check it took me a moment to work out the identity of the shape beside the hen house: this cat was casually cleaning itself in the sunshine. What you see when you don't have a gun. I could possibly have snuck back to the house and got the rifle, but I shot it with the camera instead. 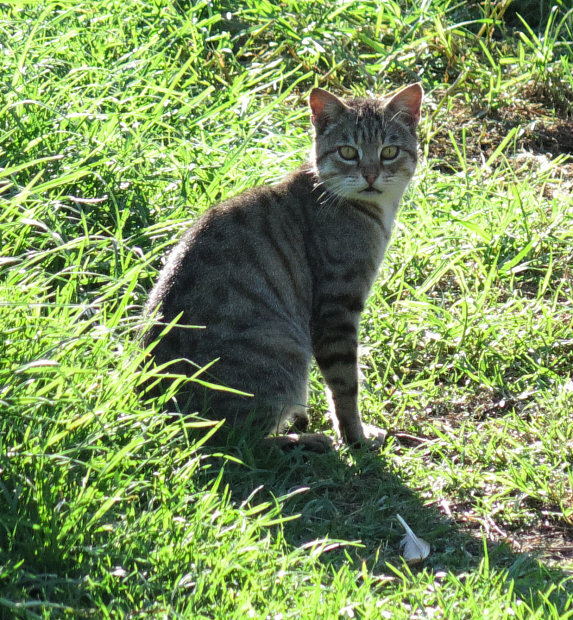 I really hope this cat hasn't or doesn't eat the Banded Rail! We have traps set and baited all the time around here, but can't catch this cat. At 4pm I started sowing the top half of Flat 2 with a Rye/Clover mix. Wherever I start I put an electric standard to mark that point, with another three metres along the paddock. 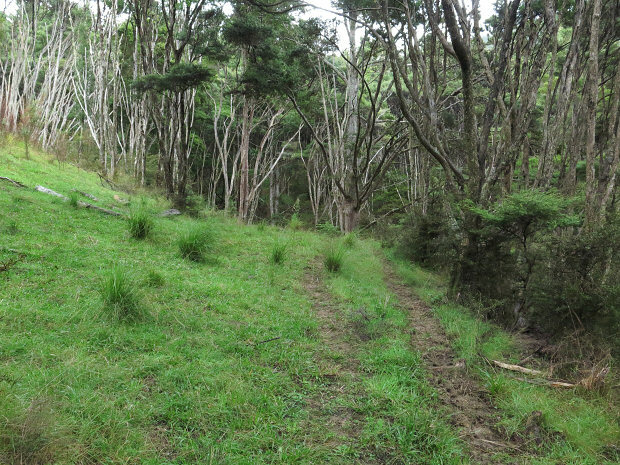 I walk to a marker at the other side/end of the paddock then reset the two there to mark the starting point and the point to which I will return and set off again to the second marker I placed at the beginning. And so it goes, up and down, up and down, at each return going back to the bag for a few more scoops of seed and to pull the bag along a bit further. 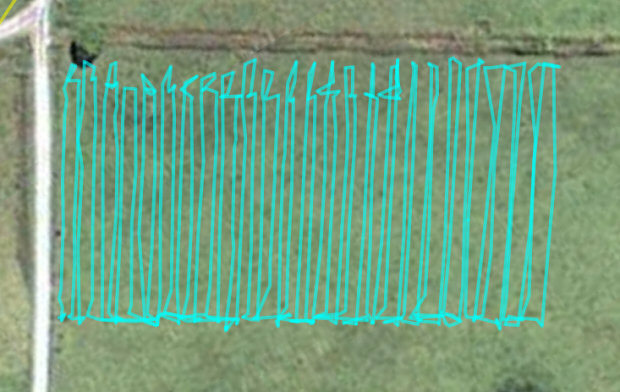 I'm not convinced the GPS measures my tracks accurately, since I'm pretty sure I rarely overlap anywhere, but it does give me a useful record of the area sown. 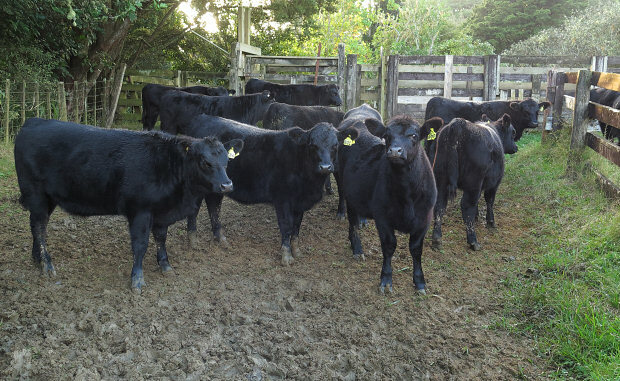 With my headphones on I listened to RNZ National's The Panel and the beginning of Checkpoint, before running a tape along beside the last sown strip and going to get the cows. According to the GPS I walked 3.4km in about an hour and twenty minutes, over an area of about 0.72 hectares. Stephan has cut a lot of Kanuka trees down in the process of opening up Route 356 and needed to get some of the firewood out of the way. 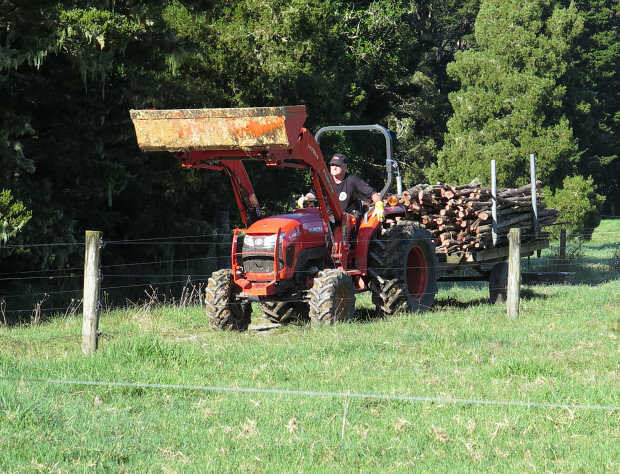 With a bit of rain last night, conditions are now a little greasy, so he brought two half-loads in, rather than trying to carry too much of the heavy, fresh wood at a time. Usually this firewood is left stacked where it is cut, before being carted in after a year of drying but this lot is now stacked closer to home. Drying can mean two things: first the sap dries after the wood is cut, which happens whether or not the wood is wet by the rain; the second step is getting it out of the rain to dry well so it will burn efficiently. Usually we bring wood from the previous year's cut in during the summer, when the weather and the wood are dry and it goes into the shed until it is needed for winter fires. The track work continues, looking increasingly messy. It's quite late in the season to be able to do this, sometimes being far too wet already. Hopefully the weather will hold for long enough to get the job satisfactorily advanced. A digger might make a slightly tidier job of widening the track here but we don't have a digger. As Stephan still loves working with the "new" tractor, he's quite happy. 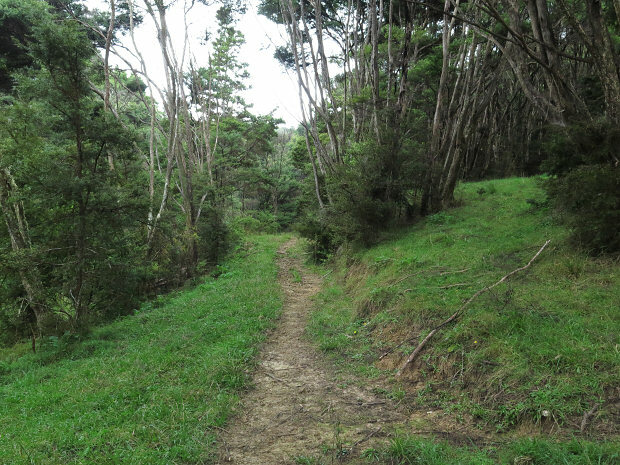 Because he kept hurting himself, we've been talking about Stephan retiring from his Kiwi-protection trapping job at Whakaangi Landcare Trust. (I've already decided, he hasn't quite finalised it in his own mind yet.) The trapping job requires at least eight hours' walking in challenging terrain and at 63, that has become more energy-sapping than it once was. On the farm he can happily work for five hours and then come home for a couple of hours over lunch and perhaps a snooze in his chair, before going back out for another two or three hours; but when being paid for a ten-hour day, there's no provision for a decent rest in the middle. He has hurt himself twice lately because of extreme tiredness and I think that signals time to stop, or he may hurt himself so badly he won't be able to continue doing the things he really loves around here. With only a year before the government starts paying him as a super-annuitant, we'll just tighten our belts again for a while. This afternoon I sowed the bottom half of Flat 2, while the cows watched in anticipation of their move to that part of the paddock. 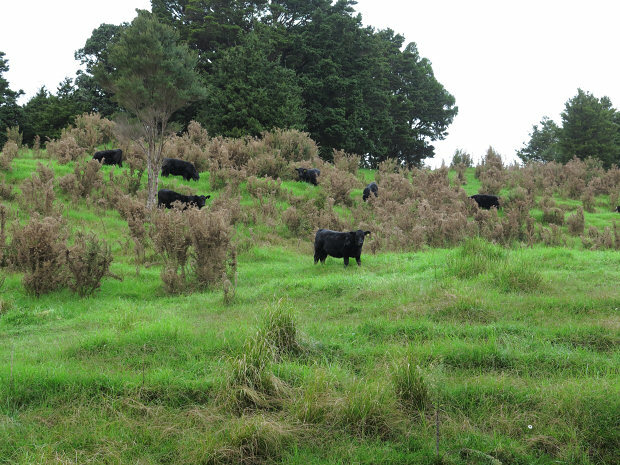 The cow in the distance, at right in the photo, is of course Demelza, who lives by her own rules, including not hanging out in the middle of mobs of other cows. 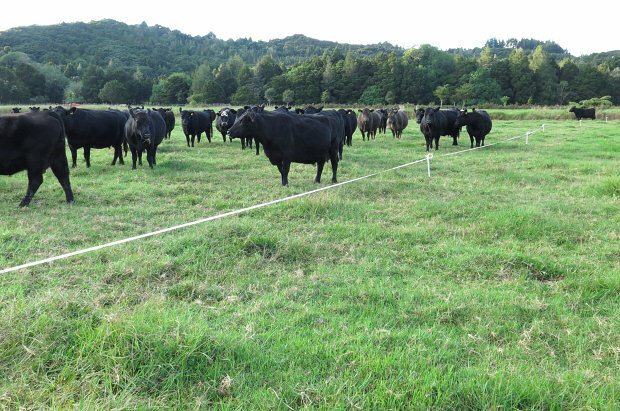 The cows chew the sown area, then Stephan will mow it and the paddock will be shut up for six to eight weeks while the new grass grows. 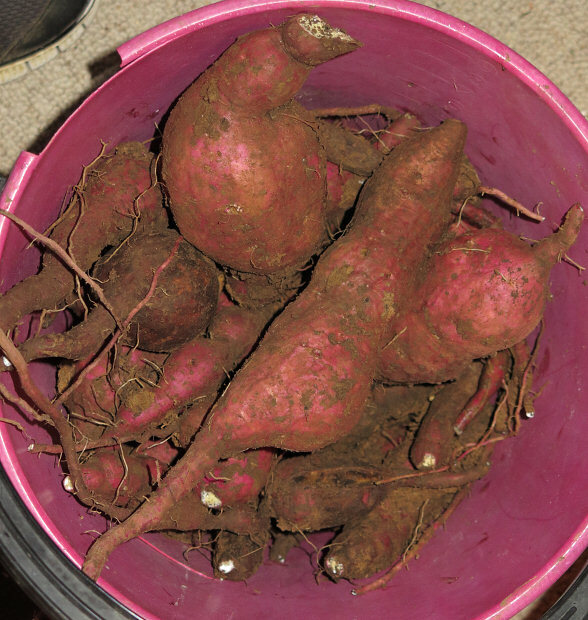 Stephan dug over his little Kumara patch this evening, finding some respectable tubers. 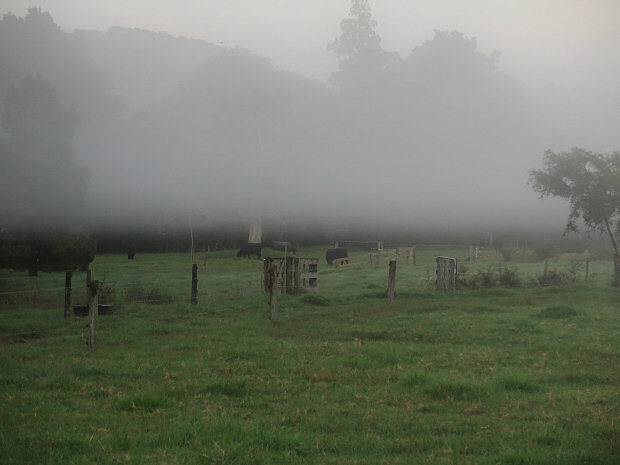 This was an odd blanket of mist across the flats this morning, below which I could still see some of the cows. We went to the funeral of the man to whom we took firewood the other week, a slightly delayed event to allow time for some family members to get here from the other side of the world. Most of Stephan's family were there too, so it was an occasion to catch up with all sorts of people. One of us has reached the age at which other people now regularly die. Funerals often have great music and a different feel to those of previous generations. The middle sixties seems to be the sort of age when health issues catch up with some people - certainly my father and brother both died at that age. Hopefully that is less common now than it used to be since Stephan still has a significant to-do list - probably some stuff he'd like to do for himself too. 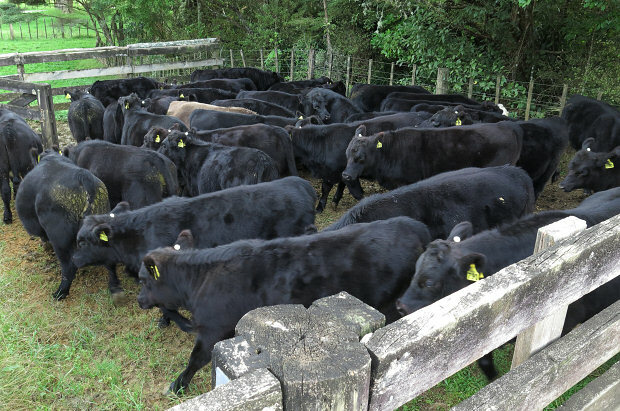 The buyer of most of my calves and I have been negotiating the sale during this week and she said they'd likely be picked up on Friday, as usual. I went out to get them in but had to call Stephan to come and help me, since they were unhelpfully on either side of the gully which divides the Middle Back Paddock. There's a really gnarly place where the cows will cross at the bottom but in which there was only one calf footprint from the last couple of days, so I didn't think they'd go across it. Eventually we got them walking up the hill and then half a dozen I'd not yet found, came down from this side, which helped encourage the others to come this way to join them. Then they conveniently all went down the hill to the gate at the bottom. While we were out in the afternoon there were a couple of hang-ups on the answerphone. I was expecting to hear from the trucking company and was surprised there was no message. Their man rang sometime after dark to say the truck would be here at 8am and that he hadn't liked to leave a message. What a twit! Lucky we got the calves in ready (although I would have moved them to the Pig Paddock next to the yards had he left a message earlier). How do people like that keep their jobs? 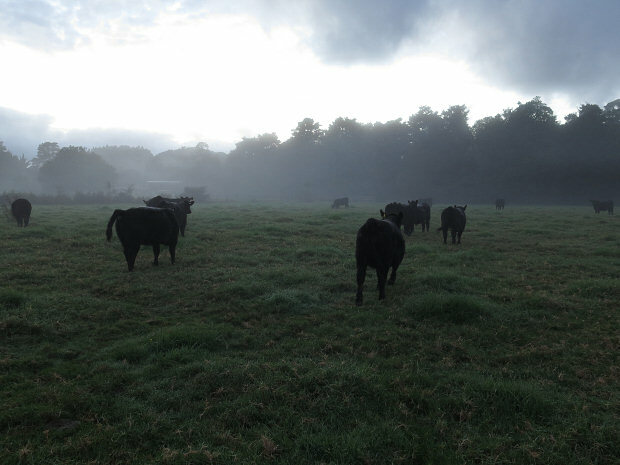 Up before dawn this morning so we could get the calves moving at first light. I had to do a bit of drafting, daub some paint on the two heifers going south to their new breeding home so they could easily be distinguished from the others. 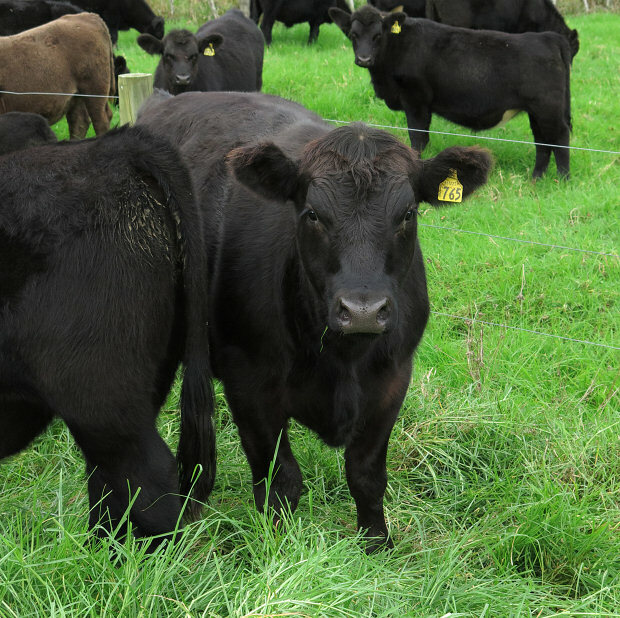 At one point a couple of steers went and stood in the race, including 804, who started his life here when we pulled him backwards from his mother, 710. He's a nice little calf. It would be a pleasure to keep all my heifers but I can't. The truck came, Noel swore at me when I said something about not using the electric prodder (Noel and I went to Taipa Area School together from when we were about 11, so I made allowances) and we got on with loading the calves. I usually go away during loading but it was all going very well and I wanted to be on hand to redraft the heifers if necessary. As it turned out that was helpful, some of them having to go up the ramp on to the top level. I put the silliest ones in that group, which meant they were keen to get away from the men behind them and loaded very easily into that high place, straight up the long ramp without stopping. 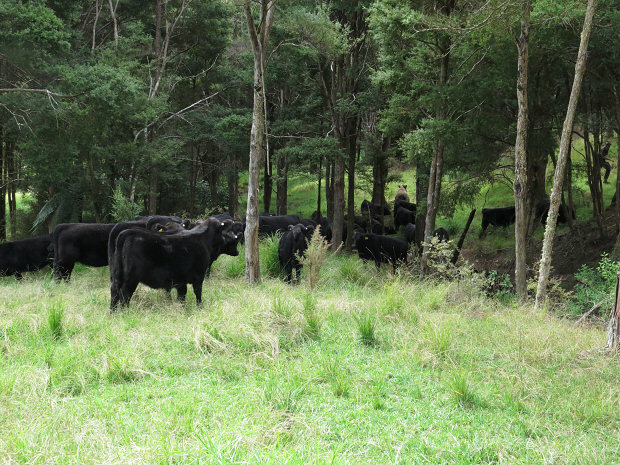 And then away they all went, 23 of my calf crop, money already in the bank. The heifers who remain and will hopefully become lovely mothers in eighteen months or so, all went into the Pig Paddock. 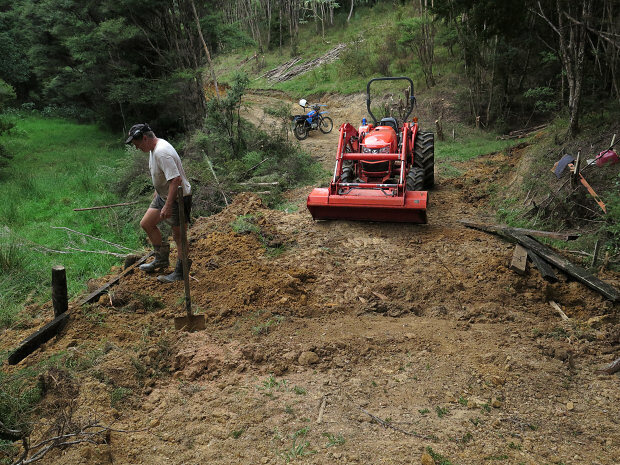 Stephan went back to his road-making and when I went out to see him, I found him finishing off the culvert replacement where the previous one hadn't worked terribly well. 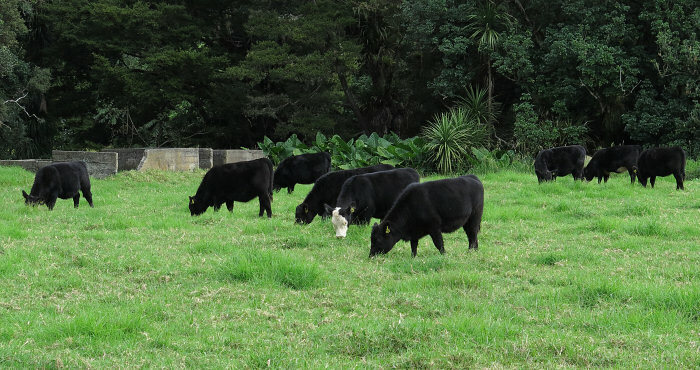 Late in the afternoon I drove over to see the steers I sold this time last year, in the paddock next to their little brothers who arrived this morning. 765 is still very friendly and came up for several head scratches. I think he has lovely eyes.